For Pi Day, I went to the best pie maker I know: my dad. I’ve had pie-loving friends rave over his pies, and he’s especially well known for his pie crust. Today I present to you his famous blueberry pie recipe! The first step is making the filling. Mix the following ingredients together. Mix enough to break some of the blueberries. Set aside. Set oven at 400 degrees. The most important part of any pie is the pie crust. These instructions are for making a lattice top pie. Mix flour and salt. Using a pastry fork cut the shortening into the flour until your mixture is even and pea sized. If you haven’t spent at least a few minutes on this step, you aren’t done. This step is the key to a flaky crust. Take half of the pastry and add 4-5 tablespoons water. Mix until it is not dry and pliable. Flour the dough, your work surface and a rolling pin. Roll the dough into a circle large enough for the bottom of the pie. Don’t over work it. Set the pie crust in the pie pan. Trim the excess and mix with the rest of the loose flour. Add the filling to the pie pan. Dot the top of the filling with small slices of butter. 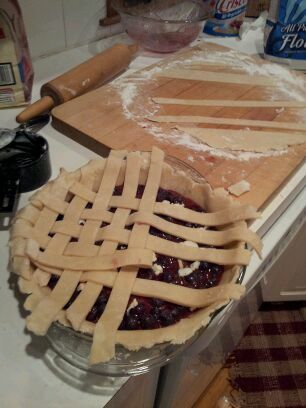 Back to the lattice top crust… Add 4-5 tablespoons water as needed to the remaining pie crust mixture. Mix the dough, flour and roll out just like the bottom of the crust. Try to roll the crust into as large of an area as possible. Using a table knife, cut the pastry into strips at 3/4″-1″ width for the lattice top. Make sure to select the longest ones to run the full distance across the pie in both directions. Start from one end and weave! It’s hard to explain but whatever you come up with will still taste good! After 30 minutes, remove the pie and lower the temperature to 375. Make a mixture of milk and egg white. Brush on the pie crust until the whole crust shines. Sprinkle with course raw sugar and again with granulated sugar. Put the pie back in the oven for 20-30 minutes until the crust is brown.